This may very well be my favorite blog-post on knitting as of yet. Check it out: Mindful Knitting. I feel if I were to describe this post, it would ruin it. So just read it. And hopefully I’ll be able to do some layout work soon. I’ve been meaning to do a little coding once life settled down. It may have done that. So I brought four WIPs up to Seattle to complete this summer before purchasing any additional yarn to work…and I finished one! Yay for finished projects. 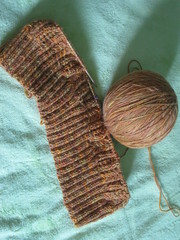 Well at least the knitting is done; I still have yet to block and seam. This was with the Manos del Uruguay yarn I had gotten at the stash sale. I know I have been mentioning this guy a lot lately. I just fell in love with the beautiful colors and texture. So I had gotten an additional skein before I left Southern California to ensure I had enough; bad, bad idea. I am left with an additional skein. So I really didn’t need to purchase that. As a result of that extra skein, I decided to start making a beanie which was my original intent for this yarn. Hopefully it’s nice, warm, fuzzy, soft, and useful for this summer – though hats aren’t typically summer wear, at least these kind. And the finished project? Well, you’ll just have to wait for the finished product pictures and the pattern to come up. I’ll post both as they come, hopefully later this week before I start working full-time and frisbee-ing it up (also known as the start to a real summer for me!). I just (kind of) finished unpacking. Or unpacked as much as I liked to…and now I’m repacking. And how is it that this time, my suitcase is already half full, containing WIPs and no clothing as of yet. At least I know I won’t have endless yarn to keep on starting new projects. This summer, NO casting on new projects til these WIPs are done. Four Five projects…not too bad, right? Stash sales are great! Or so you’re led to believe by your yarn self. Sometimes I feel as if there are two parts to myself: the let’s do it! yarn hoarder and the rational, gosh darn it, you have too much yarn already. I’ve seen both. Moreover, finding such great deals at those stash sales make it impossible to leave empty handed. I was close to spending WAY more than I did, luckily talked myself out of it. This was one of my greatest purchases, my welcome home gift to myself. I found it at Unwind’s destash/restash sale last week. 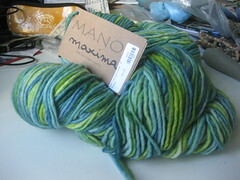 I got two skeins of Manos del Uruguay Kettle-Dyed 100% Extrafine Merino Wool. Not only was this in some of my favorite colors, but it was irresistible when I felt how nice and soft it was. Really, how could I resist? SO beautiful! Now after fully unpacking (or almost) from both being abroad and moving home from my apartment from last year, I’m discovering just how much of a yarn hoarder I really am. Granted, I’m sure many of you out there are vowing not to purchase anymore yarn…so I know this is a widespread problem as I have discussed with others at LYS’s, but considering I also have to hide this ‘problem’ from my parents…that’s definitely a problem. Hopefully I’ll start eating my way through this stash. In the meantime, I’m currently working on a new vest with some ‘final Florence yarn’ that I had purchased before I left Firenze. Worked in the round, I haven’t fully figured out how I’m going to shape the neck or arms, but I figure, that will come. I was itching to start the work. We’ll see how this goes. I’m hoping to finish this by July so I can wear it to work this summer…preferably in Seattle.